Islamic geometric art is characterized by patterns that are faithfully repeated with mathematical accuracy. A design, no matter how intricate, will not work unless it can be linked to copies of itself in a grid or a circular arrangement. This principle enables the creation of highly complex works that adorn houses, palaces, and mosques. Islamic geometric art evolved out of necessity. Islam prohibits figurative art or the depiction of living things. This prompted Islamic artists to look for other mediums and inspirations. During a time when Islamic peoples were at the forefront of science and mathematics, geometric shapes and patterns prevailed as medium and inspiration for creating art. 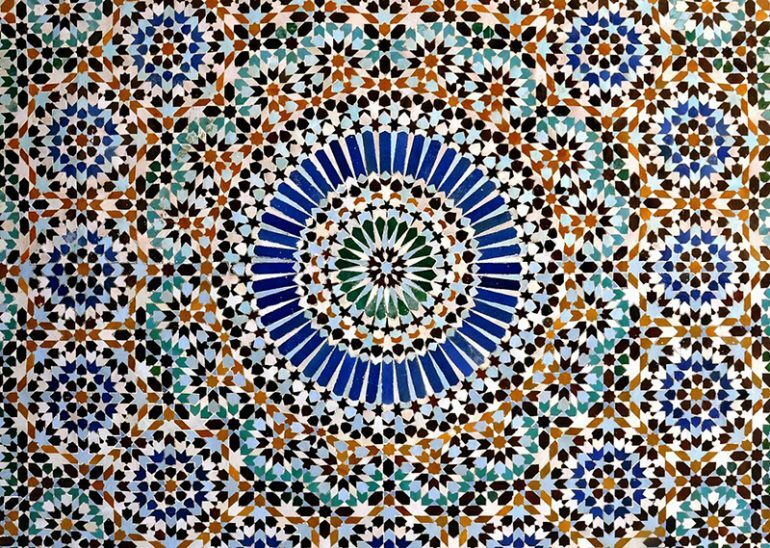 By the time the Islamic world adopted geometric art, intricate patterns were already being used by other civilizations for artistic and symbolic purposes. Islamic artists built on the foundations laid by cultures such as the Greeks and the Romans to come up with their own patterns. Over time, the patterns became more complex yet still followed strict rules of conformity and repetition. This includes lone circles and interlaced circles. The perfect circular form is one of the most basic elements of Islamic geometric art. Even if an actual circle is not included, circulars patterns formed by other elements can still be found in almost every part of the pattern. Or four sided polygons is another basic element in Islamic geometric patterns. Just like the circle, the four-sided equilateral arrangement is essential in realizing intricate designs. From a distance, the repetition of a pattern often looks like the corners of a square. Just like the star pattern, multisided polygons are the product of arranging other elements in a circular pattern. Practically, any number of sides will work. At first glance, a pattern may give an illusion and impression of even numbers but closer examination of various works will reveal that even polygons with odd numbers of sides are used. Unlike Christian art which is almost always religious in nature, Islamic geometric art does not necessarily have religious implications. While they are widely used to decorate holy buildings and sites, these geometric patterns can also be appreciated from a secular point of view. This is primarily due to the fact that humans find repeating patterns pleasing to look at. The uniformity of geometric patterns gives a sense of balance, order and maybe even peace. This makes Islamic geometric patterns appealing even to modern sensibility. Though most of its supporters and enthusiasts are still mostly Muslim, today, Islamic geometric art also captures the interest of people from different cultures. One such person is Eric Broug, an England-based Dutch artist and scholar. Broug was introduced to Islamic geometric art quite by accident when he found a book on the subject while studying Middle-Eastern politics in Amsterdam. Today, Broug is an authority in Islamic geometric patterns. He writes and speaks about the subject and creates custom works for customers from different countries.